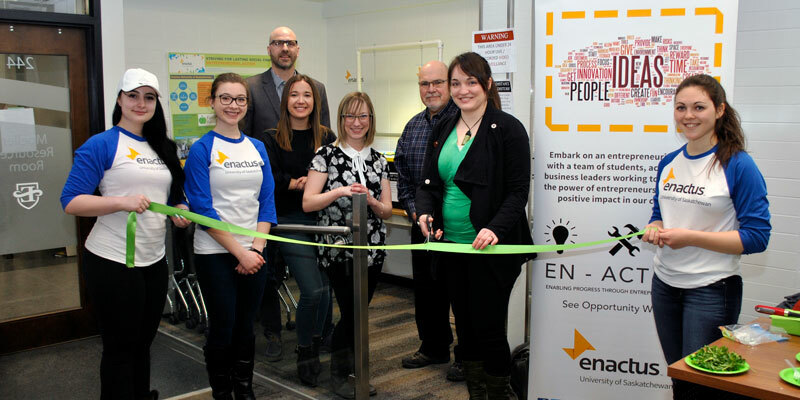 In April Enactus University of Saskatchewan unveiled a new tool for their Food for the Future program, a hydroponic system. Food for the Future started as a community garden project that addressed food insecurity in northern Saskatchewan, where communities are in a state of not being able to access affordable fresh, nutritious produce. A grocery run could involve six hours of driving or a plane flight, with both adding unnecessary pollution, cost and time to community members. By partnering with community champions, Food for the Future empowers participants by providing them with the education, materials and tools needed to grow and maintain sustainable gardens. Our Enactus team has travelled to Beauval, St. George’s Hill, Pelican Narrows, Cumberland House and Dillon to provide education around our Food for the Future program. Over the last four years, Enactus has helped build 189 garden beds, reduced CO2 emissions by almost 2 metric tons and diverted over 800 pounds of waste from landfills. Most importantly, over 200 people in northern Saskatchewan have been empowered through creating community gardens and in the educational workshops provided on gardening, composting and food preservation. By adding the hydroponic systems to Food for the Future, Enactus will help communities reduce water consumption up to 90%, while reducing the need for transportation for large amount of soil to the remote communities. One system can provide up to 480 lbs of produce year-round. This coming summer, we will partner with One Arrow First Nations and Dillion to pilot the hydroponic system as a tool to reduce food costs.